Genie Scientific has been building and installing chemical fume hoods for three decades. We continue to offer the safest, most durable equipment on the market. Whether your laboratory needs benchtop fume hoods, walk-in fume hoods, or custom fume hoods, we can help. Browse through our product list to find the most appropriate steel fume hood for any environment or application. When it comes to working with chemicals, there are three things that take priority: the safety of the laboratory staff, the quality of the reactants, and the quality of the products/results. Without a decent fume hood to maintain proper air flow and keep the work isolated from the rest of the lab, you run the risk of spills, exposure to dizzying fumes/particulates, cross-contamination, and more. It’s also important to have a fume hood that offers sufficient feedback. Features like alarm systems can help you keep an eye on your hood’s function and ensure that important measures such as air flow are correct at all times. Every custom order has the option of adding convenient accessories like airflow alarms, additional outlets, sinks and plumbing, distillation racks, sash stops, cord ports, and much more. A great deal can also be said about using the wrong fume hood design for a given type of work. It’s difficult to provide appropriate ventilation and isolation in a bench top fume hood that could be better completed in a large walk-in fume hood environment. 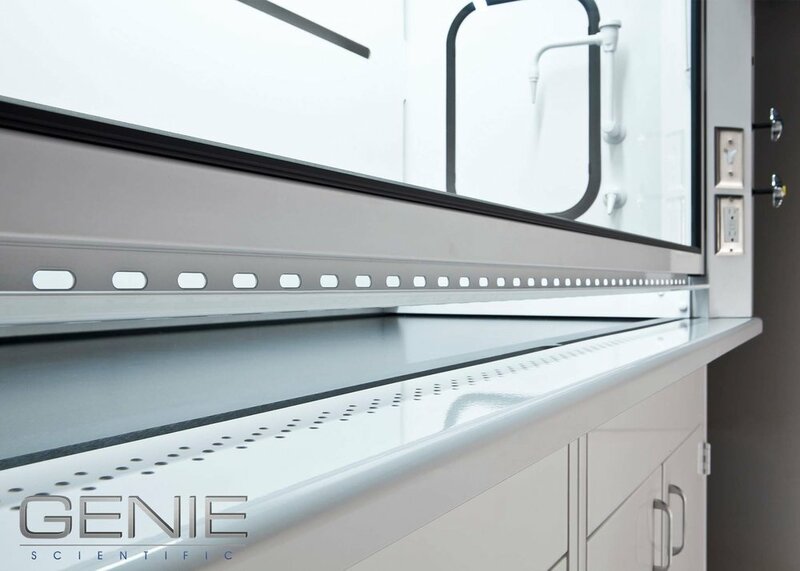 At Genie Scientific, we take all of your needs into account to help you determine exactly what kind of fume hood your lab needs, then design a custom product around that information. Each of our fume hoods has been inspected by the Underwriters Laboratories and has met stringent standards for safe operation. Our hoods also meet ASHRAE 110 standards (determined by the American Society of Heating, Refrigerating and Air-Conditioning Engineers, or ASHRAE), which govern the testing of laboratory fume hoods for proper performance. Genie Scientific equipment continues to pass these industry-standard tests with flying colors! We offer a complete line of fume hoods for all applications. Each fume hood comes in standard sizes with a variety of fixtures and custom options to suit any kind of work. Constructed with a durable steel superstructure and lined with chemical-resistant liners, our hoods are built to last a lifetime. Each one of our fume hoods also comes equipped with a sturdy chain and sash system that can withstand the wear and tear of daily use; work surfaces designed to safely contain spills; aerodynamic airfoils to ensure optimal ventilation; and exhaust collars that fit easily into your existing HVAC system for easy installation. At Genie Scientific, delivering furniture with long-lasting, superior quality is of the utmost importance. At Genie Scientific, we’ll also install your fume hood and any other custom furniture you order from us. Our experienced lab furniture installation team will make sure the job is done right so that you’re never left trying to patch ductwork or reinstall it yourself. Our design and manufacturing teams are thorough and precise, ensuring that all measurements are accurate and that your custom fume hood will fit your lab just as expected. Any issues that may arise along the way will be addressed promptly and efficiently by a Genie team member; your satisfaction is our priority! Why Choose a Genie Fume Hood? Every hood has a strong, reliable counter-balanced system of sash movement that is guaranteed never to fail. We install an extremely durable liner in each fume hood as a standard option. This protects the structure of the fume hood against damage from any chemicals used inside it. Safety is first and foremost when it comes to Genie laboratory furniture. Our SpillSafe work surfaces are dish-shaped to keep any spills from escaping the fume hood environment. Our walk-in fume hoods are outfitted with heavy-duty horizontal SlideSafe doors that glide easily and are jump-proof for safety. Our SlideSafe door systems are exceptionally strong and durable, with a sturdy I-Beam and rugged track hardware. Airflow is key to proper fume hood operation and overall laboratory safety, which is why we fit each hood with an AirDirect airfoil for efficient air movement and floor sweep. We use simple, easy-to-install exhaust collars to make fitting our fume hoods to any HVAC system a breeze. No additional ductwork or hardware is needed to install our hoods—just the included basic, round connection. If you’re interested in purchasing a custom Genie Scientific fume hood, first check out our fume hood selection guide to learn more about fume hood price and fume hood specifications. Use the guide to determine the appropriate hood fume size and type, suitable sash options for your bench top fume hood, the proper liner material, the ideal fume hood CFM for your laboratory conditions, and more. Once you’ve selected the right options, browse through our product catalog to find the unit that fits your needs. If you have any questions about our products or would like to talk to one of our professional lab planning services staff, call us today at 800-545-8816.